i have developed a frontend for fsarchiver. fsarchiver_dialog is a frontend of fsarchiver clone partitions program and now is for experimental use. This is a very nice! Good job. Why do you use "dd" with "count=63" ? Would not "count=1" be enough? for backup of standard MBR and partition table, bytes to save are 512. In case of use of GRUB or other boot manager, frequently are used many other bytes after 512 ... in a space conventionally called "unused space". I am having a little trouble however because the terms "source" and "target" (or similar) are not used in the initial screens, and I am having a bit of trouble to determine exacty "which is which." I am going to do a bit of trial and error and see it I can figure it out, but it would be great if you could point me in the right direction before I resume work on this, tomorrow. Once I get it figured out I could offer some suggestions based on why I was confused. I may mention, I have used other software such as Norton Ghost, and seemed to get it straight there, just by reading the prompts. RonC wrote: This is a great idea. Hello!, I try to explain concept of my script. Selection P (set path for save/restore) is a preliminary operation for select where save or restore file image. This action is same for backup or save operation. After this, (automatically started) is necessary select what you want to do. In case of "restore partition" (I) destination disk and partition (target) are where you want to write new datas previously stored in image file. 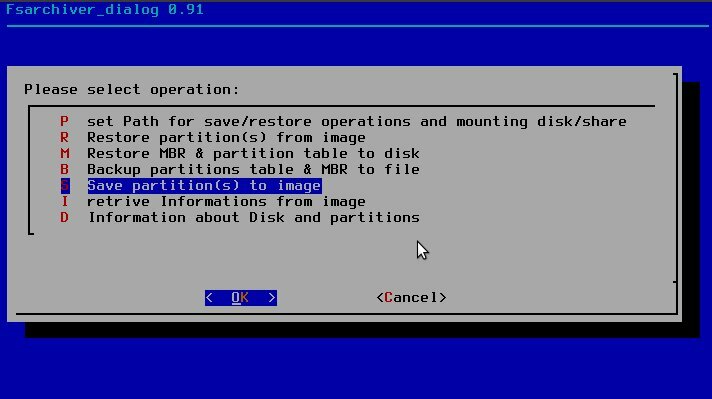 -option R for restore a partitions from image (...source...) to a destination target. I think my script will to be improved, in particular a gui is critical for keyboard input of files path.. but for me is no necessary change it in first test.... (use default!). Ah! My mistake was in first using Menu selection S, for save to image. P should have been first, for selecting the path.